Home School in the Woods offers a selection of hands-on history unit studies for a variety of ages. When a review for one of their studies was offered for review, I was pretty excited. 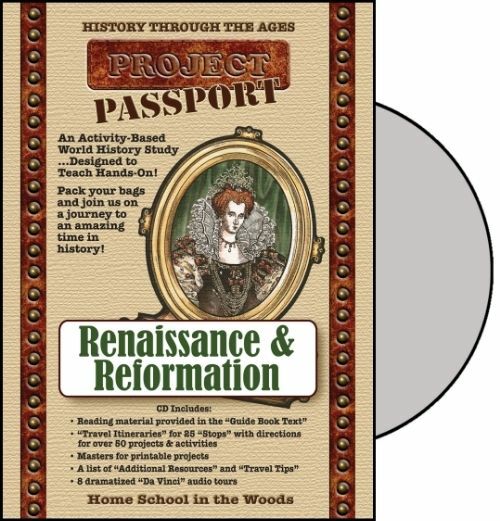 History this summer was my plan, so I excitedly chose Project Passport World History Study: Renaissance & Reformation as my first choice. I received everything for download and printed out the pages I needed to make lapbooks and other “printable projects” to go along with our study, but I left the reading (which I did aloud) on the PDF and read straight from the computer. Receiving the information on CD is the other purchase option from Home School in the Woods. This was designed for grades 3-8 and I did it with my four older children, ages 6, 8, 10, and 12. It was definitely difficult for my younger ones, but they hung in there, although I did get the glazed look from them more than once. I’d recommend keeping this for the upper ends of the elementary and middle school years – my six (nearly seven) and eight year olds are doing 3rd and 4th grade work but weren’t read for this comprehension-wise. With a travel theme, our study of the Reformation and the Renaissance started out with an itinerary, travel tips, “stops” along the way where we learn, a visa to foreign lands, and a timeline we were “traveling”. I scanned it, choked at what looked like far more work than my tired pregnant brain wanted to endure, and put it away for a day. The next day I found the Travel Itinerary – labeled as such but I have searched for that file more than once! I don’t know why I can’t figure it out more clearly. Once I found that, it helped a whole lot to make more sense of this program. That and the Guide Book Text are the place to begin – before getting overwhelmed! I printed out the work pages we needed and started to get my footing. It still seemed a little overwhelming but it’s really laid out quite clearly on what’s needed when once you dig in. We’ve read, had fun, learned, and discussed, so it’s been good, even when I’m not certain I’m even “doing it right” with all the rabbit trails we’ve taken. (I read “October 31, 1517” and could not possibly be a good Reformed Presbyterian and leave that alone. We spent a good couple hours discussing what exactly happened on that date and what the people – on both sides of all of this, must have thought, down to the beautiful cathedrals we’ve only seen photos of and how a nail in a door like that must have offended so many! We only made it through the first “stop” and have begun another, stopping to discuss and put into easier terms for my kids what they didn’t understand, so we’ll not be getting through this in the stated eight to twelve weeks, and we can spend a full semester and possibly two on this pretty easy, but that’s just us – and my school full of smaller students trying to keep up. This would be much faster if I’d chosen to only teach my oldest, or perhaps oldest two, but then my quest to teach history this summer would have been vastly reduced. One of the first things we needed was a folder to make our travel visa, and I missed that until we hit the point in our first day that we needed it. Everything came to a halt while we added necessary items to our list. Crayons, glue, and scissors have a permanent place in this curriculum as well – plan to have those on hand before you start! By far the best part beyond the learning and discussion itself was the newspaper style form to fill out regarding our travels and what was learned. We just did one of these, and the older ones worked on it together. The older ones, again, were far more capable. It is super fun to see what their take on what we just read and talked about it, and how much they comprehended. This unit study, while full of a vast array of projects, recipes, and interesting things to make, was not as in depth as I’d have liked as far as the history itself. I have dug through the files, thinking I’m missing something, but haven’t found it. I am, admittedly, a textbook learner who prefers to read it myself and move on. Art, unfortunately, isn’t something I am good at… at all. This would be fabulous for the reluctant student or make for a great one-on-one study with a teacher who excels in art and making learning far more interesting than just book work. A unit study, in my mind, covers a vast number of ages, and this one didn’t quite have the ease of use for many students as I’d have liked, unfortunately. If I had been able to sit down with just one of my older students, we could have a whole lot of fun with it, but the variety of ages I have and the number of projects made it difficult. We made it work for us – and you totally can – but we didn’t get nearly as much out of all the activities as we could have under different circumstances. For the download version of this study, it is priced at $33.95. A CD of the same study is $34.95. They are very well down, with abundant graphics, drawings, and the like, and include several files to keep your study interesting, particularly for the visual learner. 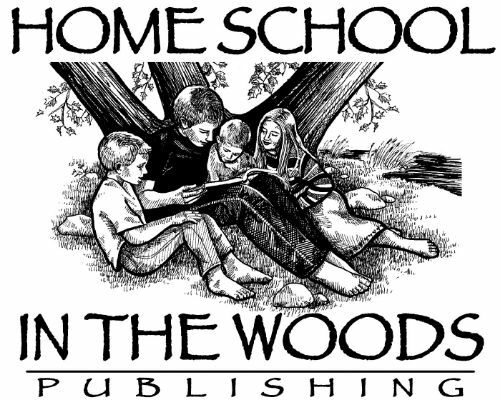 Home School in the Woods can be found on Twitter, Facebook, Pinterest, and Google +. For the rest of the Crew’s thoughts on this and two other hands-on history programs from Home School in the Woods, head over to the Review Crew Blog.